Ohio senior Kylan Nelson (23) returns a punt for a touchdown, during the Bobcats’ 21-point victory over Akron on Friday in Athens, Ohio. ATHENS, Ohio — History made, and moving on to bowl season. 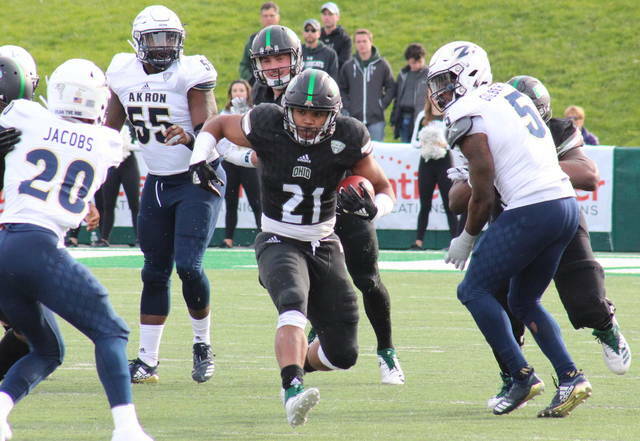 The Ohio football finished perfect at home for the first time in 50 years and senior Papi White became the program’s all-time leading receiver, as the Bobcats cruised to a 49-28 victory over Mid-American Conference guest Akron on Friday afternoon in Peden Stadium. 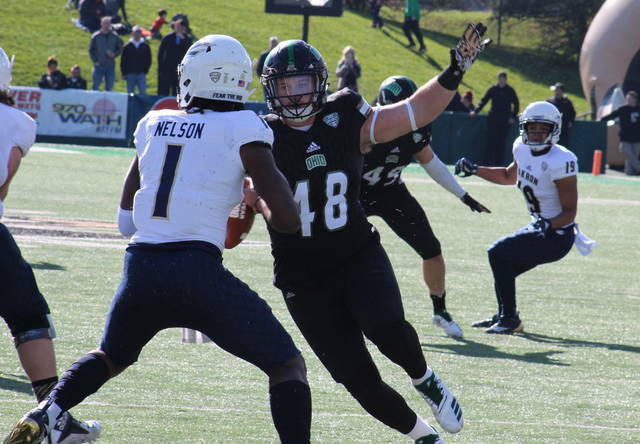 Ohio (8-4, 6-2 MAC) — which finishes tied with Miami for second, behind Buffalo, in the final MAC East standings — forced a three-and-out on the game’s opening drive and took possession at its own 20. The Bobcats began their first drive with back-to-back first down passes from Nathan Rourke to White, with Rourke getting the hosts into the red zone on with an 18-yard scramble on the next play. Next, A.J. Ouellette carried the ball on back-to-back plays, getting to the six six-yard line and then into the end zone. Louie Zervos — establishing new career and season Bobcat records for successful extra point kicks — made his first of seven consecutive point-after tries, giving the hosts a 7-0 lead with 11:02 to go in the first. After a punt by each side, Ohio’s defense came up with the game’s first takeaway, as sophomore Austin Conrad picked off a Kato Nelson pass at the UA 20. The Bobcats gained a first down after two plays, but an incomplete pass and a sack led to a third-and-goal from the 16. Rourke scrambled for 15 yards on the third down play, and the junior quarterback covered the final yard on a fourth down run, giving the hosts a 14-0 lead. Akron (4-7, 2-6) suffered another three-and-out on the ensuing drive, and OU senior Kylan Nelson returned the punt 37 yards for a touchdown. Nelson’s score was Ohio’s first punt return touchdown since 2011 and gave the Green and White a 21-0 lead with 2:38 left in the opening period. The Zips got on the board on the second play of the second quarter, as Kato Nelson tossed a 10-yard scoring pass to Van Edwards. Nick Gasser made his first of four extra point kicks, cutting the Bobcat lead to 21-7. Ohio punted on its ensuing drive, but Akron missed a field goal and gave the Bobcats the ball back at their own 30. The Green and White needed seven plays — including a quartet of Ouellette carries for average of 12.75 yards per attempt — to increase their lead to 28-7, with Ouellette scoring on a 16-yard run with 5:33 left in the half. Akron and Ohio both punted again before the half, and each side also punted on its first second half possession. Bobcats senior Maleek Irons picked up back-to-back first downs on the next Bobcat try, but Darian Dailey wound up intercepting a pass for the Zips at their own 16. UA went 84 yards in seven plays and cut the Bobcat lead to 28-14 with 5:25 left in the third, when Kato Nelson tossed a 17-yard scoring pass to Andre Williams. The Green and White responded almost immediately, as Ouellette took the ball to the UA six-yard line with back-to-back carries to start the drive 75-yard drive. After an incomplete pass, Ouellette moved the ball to the one, where Rourke plunged into the end zone on a third down carry, making the Ohio lead 35-14 with 3:09 left in the third. Akron trimmed its deficit back to 14 points with a 10-play, 79-yard drive that was capped off by a six-yard scoring pass from Kato Nelson to Brian Reinke with 14:19 left in the game. Ohio responded with its own 10-play scoring drive, with Rourke finding paydirt from five yards out on his sixth carry of the possession to make the Bobcat lead 42-21 with 8:21 to play. UA answered quickly, going 93 yards in five plays and 1:30, with Kato Nelson finding Mykel Bennett for a 12-yard scoring pass. 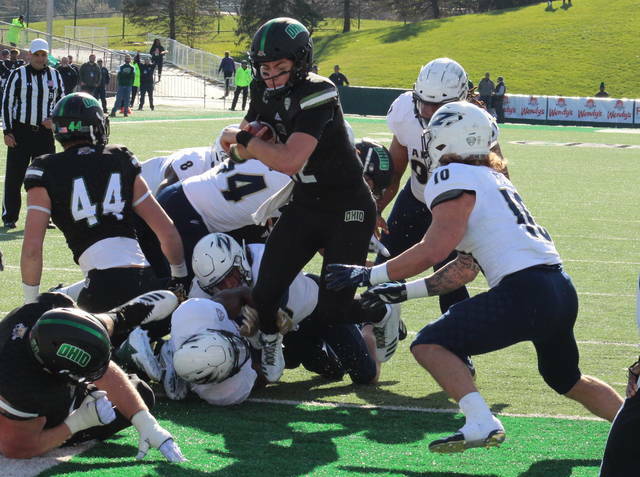 The Bobcats sealed the deal by going 75 yards in 12 plays, with Irons toting the rock 10 times between a nine-yard run by Rourke to start the drive, and a three-yard touchdown run by Rourke to finish it off with five seconds left in the game. 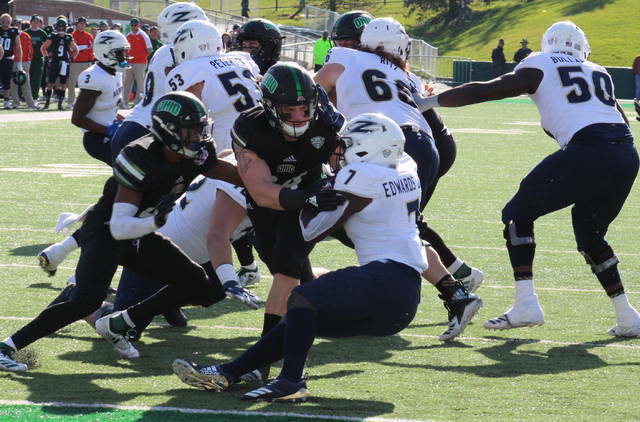 Following the 49-28 victory, 14th-year Ohio head coach Frank Solich was satisfied with the victory, although he noted it wasn’t the best his team has played this fall. OU was flagged eight times for a total of 95 yards, while Akron was sent back nine times for 81. Ohio earned a 25-to-23 edge in first downs, converting on five third downs and one fourth down, with the OU defense holding Akron to 3-of-9 on third down. 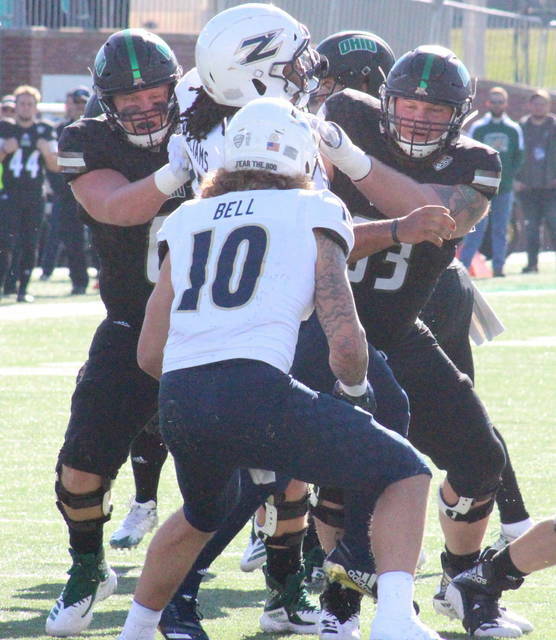 The Bobcats outgained the Zips by a 468-to-388 count in total offense, including 381-to-32 on the ground. With 7.5 yards per carry, Solich gave credit to his offensive line for their consistency this season. Ouellette — who caught one pass for 17 yards — posted a game-high 169 yards on 15 carries, with a pair of touchdowns. 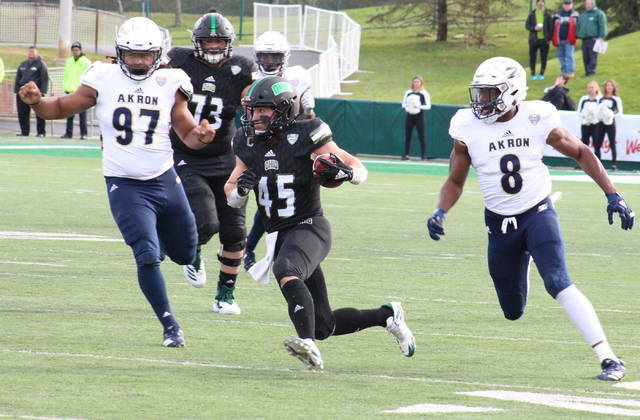 During the game, Ouellette surpassed the 1,000-yard mark for the season, making him one of only four running backs in program history to reach the milestone in multiple campaigns. Irons caught one seven-yard pass and carried the ball 18 times for 126. White caught three passes for 63 yards and now has a program record 2,530 career yards, surpassing LaVon Brazill. Rourke was 5-of-14 passing for 87 yards, to go with 18 carries for 86 yards and four touchdowns. On defense, senior Evan Croutch had team-highs of 10 tackles, six solo tackles and two tackles for a loss. Croutch and Amos Ogun-Semore each recorded a sack, with Conrad grabbing his first-career interception. For the Zips, Edwards had a team-best 19 yards on 11 carries. Kato Nelson was 24-of-41 passing for 356 yards and four touchdowns, with Williams hauling in a game-best seven passes for 81 yards and a touchdown. Jamal Davis led the Akron defense with team-highs of 11 tackles and two tackles for a loss. Prior to the game, Ohio honored its senior football players, competing for the final time at Peden Stadium. This marks the first time since 1968 that Ohio has won all of its home games. It’s the first time since 1988 that the Bobcats went unbeaten at home, with one tie that season. 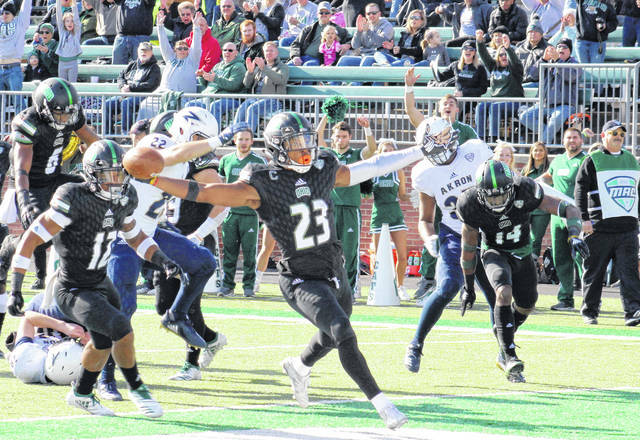 The Bobcats are now 20-14-1 against Akron in all-time meetings, with Solich improving to 11-3 against the Zips.